Rome is almost Nearly a vacation home recognized and authorized by the City of Rome and by the Provincial Tourism. It is located in a quiet, residential neighborhood: the "Trieste" neighborhood. - About 900 meters the Nomentana Station transited the FL1 underground train that connects directly with Fiumicino Airport. Within 100 meters from the apartment there are several banks, a post office, two supermarkets and a local market, pizzerias, restaurants, a multiplex cinema, a games room, an internet point, a laundry, two wineries and a shop of typical Italian products. At 600 meters one of the largest and most beautiful parks in Rome: Villa Ada, where you can go horseback riding, rent bikes, a summertime concerts. The apartment is covered with high-speed Internet access network for the exclusive use of our guests. The apartment is a large open space of 50 square meters, cozy and quiet, newly renovated and cared for in both finishes in both facilities. In the living area a living room with 32 inch LCD TV, DVD player and a sofa that, if needed, becomes a comfortable double bed. The kitchenette is equipped with stove, oven, microwave, bottle warmer, dishwasher, refrigerator and freezer, toaster, juicer, coffee maker and a large range of accessories for cooking. The sleeping area is located on a brick loft and is equipped with a double bed or twin beds, bedside tables, stools and chest. The bathroom is equipped with a spacious and comfortable shower, stool, soaps and hair dryer. In the apartment you will find towels and sheets, as well as kitchen towels. We live near the apartment, then for any need we will be in a few minutes at your disposal. in the bathroom you will find towels, hair dryer and soaps. We recommend this appartment. It is very comfortable, nice, it is in peacful and calm place, only cca 3km far from center of Rome where you can go bus or metro. Even with your own car you can go to the center. The owner is very kind and is always ready to help. If we will anytime travel to Rome, we will definetly stay in this appartment. 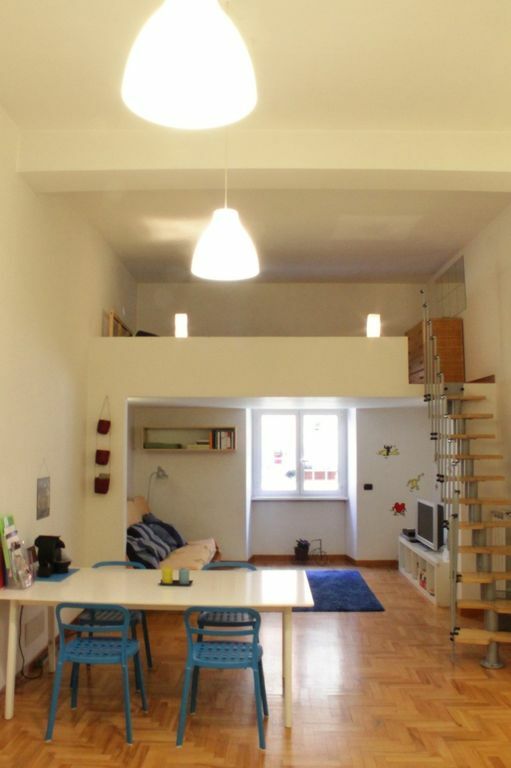 Appartamento molto confortevole, semplice ma completo di tutte le comodità. I proprietari persone molto disponibili. Nelle vicinanze molti servizi (Ufficio postale, edicole, tabacchino, cinema, supermercati ed una buonissima pasticceria consigliata dalla proprietaria dove prendere le brioches per la colazione). Tanto soddisfatto che ci tornerò a settembre. Grazie per la bella recensione, saremo liete di ospitarvi quanto prima! It almost Roma is located in 'Trieste' and is just minutes from the historic city center. At 400 meters, in fact, there is a transit stop of the metro line B1. With just 4 Metro stops can be reached in less than 10 minutes to Termini Station. It is extremely well connected with the Fiumicino airport and the Trastevere district through a direct underground train (FR1 - Nomentano station 800 meters - 1 metro stop). The house is 3 km from Policlinico Umberto I and 2.5 km from the Hospital Sandro Pertini. Right next door also the University 'La Sapienza' and 'Luiss'. Less than two km is the beautiful Villa Ada, one of the largest green areas and beautiful in Rome.